Yaskawa Levanto has a gripper capacity of 30 mm. The normal stack thickness is around 25 mm, which implies that Yaskawa Levanto moves significantly heavier stacks than the typical operator, which improves the overall capacity. The stack thickness selection is performed at the touch-screen and depends on the quality of the substrate. Yaskawa Levanto has a cycle time of around 20 seconds for lifting a stack of sheets to the vibration table. With a stack thickness of 25 mm this gives a capacity of between 4 and 5 pallets per hour (90 cm pile on the pallet). The speed depends on the quality of the substrate. The dual-arm humanoid Motoman SDA20 robot is, with its two arms, the only robot in the world, which can copy the operator’s highly skilled separation and airing patterns required for the efficient separation and airing of the sheets. Without this stack preparation, the vibration table will not be able to vibrate the stack of sheets into perfect register. Based on the operator’s skills and experiences the angle of twisting the stack can be controlled from the touch-screen. Some operators prefer to let a twist of the stack in one direction be followed by a twist in the opposite direction, and Yaskawa Levanto can also perform this working pattern. The quality of the vibration depends on an appropriate quantity of air between the sheets after they are positioned on the vibration table. The vibration table is equipped with a back-plate with both a strong air supply through segmented air-nozzles and an exhaust system for air. After stopping the blowing process the only way to remove the air between the sheets and maintain their correct position is to allow the air to escape along the back-plate. The air management is performed by Yaskawa Levanto. It is important that the vibration process stops in a soft and controlled way, so all sheets are in the correct position when the vibration stops. This is obtained by letting Yaskawa Levanto control the vibration process. The status of the printed pile is a real challenge for all automatic systems. An unprinted pile of sheets has normally an even surface status, but as soon as the sheets are printed, the pile status changes in an unpredictable way. This depends on the conditions in the pressroom, the quantity of inks in one area of the sheet compared to another, the drying process and how the printer put the wedges under the pile. Yaskawa Levanto performs a dynamic scan of the pile status every time it begins to feed a new stack to the vibration table. There are limits to the quality of piles, which Yaskawa Levanto can handle (see specifications), but the dynamic check of the pile status secures that Yaskawa Levanto can handle a wide variety of piles with fluctuating status. Maximizing the sheet cutter capacity implies minimizing the number of cuts. This is done by carefully calculating the height of the stack on the vibration table in relation to the height of the pile on the pallet. A few centimeters left on a pallet for a final cut decreases the productivity. This optimizing process is, in principle, an impossible task for the operator, but it is easy for Yaskawa Levanto, which always knows the height of the pile on the pallet, the pile status and the potential height of the stack on the vibration table. Running the highest stacks possible normally maximizes the sheet cutter capacity, but high stacks are heavier to transport, especially if the stack status makes the sheets curl, which increases the friction between the stack and the air-cushion table. The strong transport system moving the stack from the vibration table and to the sheet cutter side table allows using maximum heights and eliminates any reason for not running the maximum stack height. A pile of sheets are not always only good sheets. For every job there is always the start-up waste. Depending on the printing procedure it is either removed by the printer or a pallet change is performed before starting to print good sheets. Both procedures are time consuming, because they include a stop of the press. Some jobs generate, unfortunately, running waste, which also has to be removed prior to finishing, and this and only be done at the cutting line. Yaskawa Levanto’s scanner detects taps inserted in the pile and remove selected pile segments to the waste container. This saves time at both the press and the sheet cutter. This feature also implies that several short run jobs can be printed on the same pallet, which reduces the number of pallet changes at the press, so Yaskawa Levanto improves the productivity of both presses and sheet cutter. All conventional sheet cutter lines have a lifting table, which is only accessable from one side. Significant sheet cutting time is wasted on conventional pallet changes, as the vibration table cannot be filled during the pallet change. 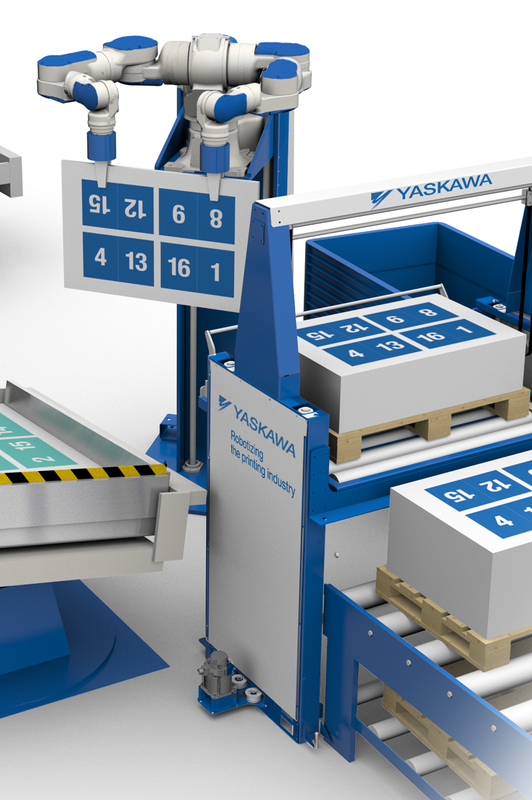 Yaskawa Levanto’s lifting table in connection with the conveyor system reduces the down time for pallet changes to nearly nothing. Some jobs, such as magazine covers with coatings, require a pile turning between printing and finishing. With Yaskawa Levanto’s integrated the stack turning capability, the time for an external, time consuming pile turning process is totally eliminated. Transporting the stack from the vibration table to the sheet cutter side table takes time. With Yaskawa Levanto’s automatic transport system a new stack is always just next to the operator at the sheet cutter, which maximizes the sheet cutter’s cutting time.